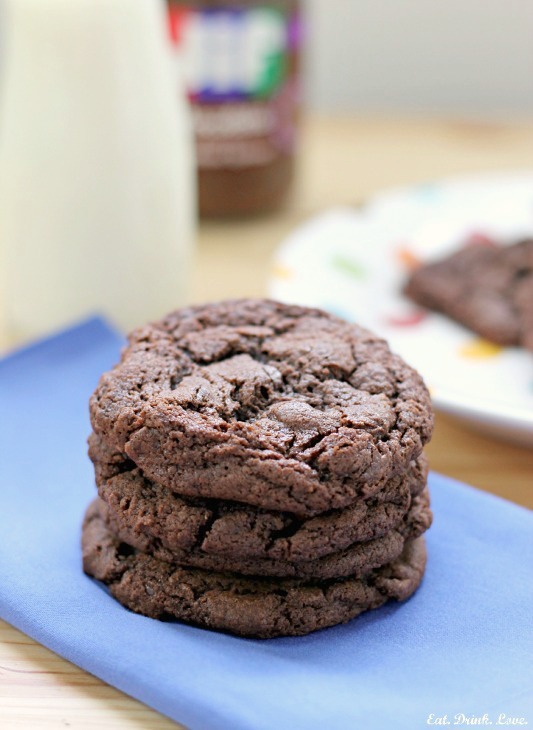 Chocolate Hazelnut Cookies - Eat. Drink. Love. I passed my dissertation defense!!! I am Dr. Stephanie!!!! WOOOOOOOOOO!!! It’s been such a stressful last couple of months. Defending a dissertation is no joke and is both mentally and physically draining. I don’t with it upon my greatest enemy. Ok, I don’t really have a greatest enemy, but if I did, My brain is fried and I am sleep deprived (hey, that rhymed!) and I am dreaming of a long and lazy vacation that really just involves sleep and tv. That’s really all that I want right now. I also really want to eat a bunch of cookies that a full of chocolate. So let’s celebrate with some fattening and delicious cookies! I took my usual chocolate chip cookie recipe and made some adjustments to make these nice and chocolatey cookies. My favorite thing about these cookies is Nutella. Nutella makes everything in this world better, don’t you think? 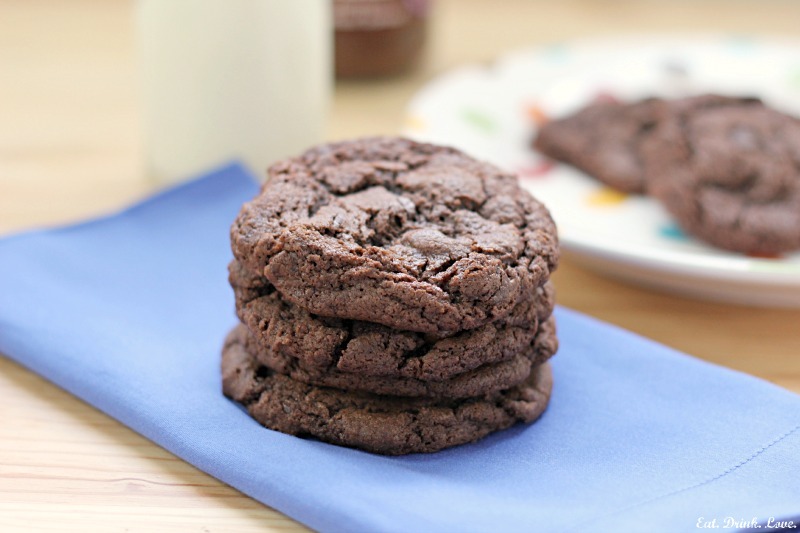 Rich chocolate cookies made with creamy Nutella and chocolate chips! In a large bowl, beat together the butter and sugars. Mix in the egg, chocolate hazelnut spread, and vanilla extract. 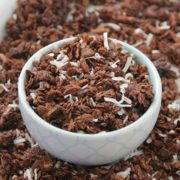 In a separate bowl, mix together the flour, cocoa powder, baking soda, and salt. Slowly beat in the dry mixture in with the wet mixture until well combined. Stir in the chocolate chips. On a lined baking sheet, spoon out dough, in about 1 heaping tablespoon, onto the pan, leaving about 2 inches in between each cookie. Bake for about 10-12 minutes. Chocolate cookies are the best, aren’t they?! Congratulations! 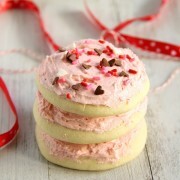 This looks like the perfect way to celebrate :) I am dying for a plateful of these cookies! Congratulations! What an accomplishment! 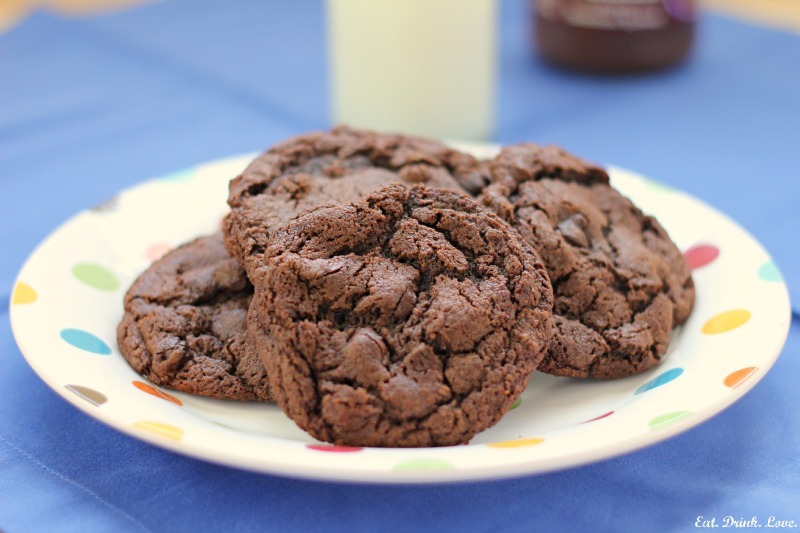 And I love that you used Nutella in these cookies – that automatically makes them a must-try! Thank you, Elizabeth! Nutella makes everything better! CONGRATS! My friends passed her dissertation defense today too! Hopefully that’ll be me in one more year. Thank you, Erin! It will get here before you know it! It’s such a crazy exciting time! CONGRATS Stephanie!! That is such amazing news. SO happy for you! Congratulations, Dr. Stephanie! That is a huge achievement! The cookies look fantastic too, but I’m mostly just excited for your being done. I am mostly excited about that as well, lol! Two congratulations are in order. One for the dissertation and another for the cookies. Go Dr. Stephanie! That is super cool! Thank you, Laura! Chocolate peanut butter would be amazing! Congratulations! I am so happy for you!! The cookies look delicious!! Have a great weekend!! Thank you, Ramona! It feels great to finally be done!! mmm, chocolate hazelnut – a match made in cookie heaven! It is a perfect combo, right?! What a delicious way to celebrate! 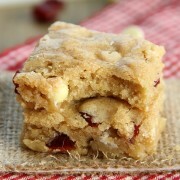 I just made cookies almost identical to these and they were so, so, so good! I used Nutella and Ghirardheli dark chocolate chips, yum! Thank you, Anne!! It feels so good to be done!! Thank you, Sarah!!! The more chocolate, the better, right?! Congrats, Dr. Steph! And these cookies look like the perfect way to celebrate!